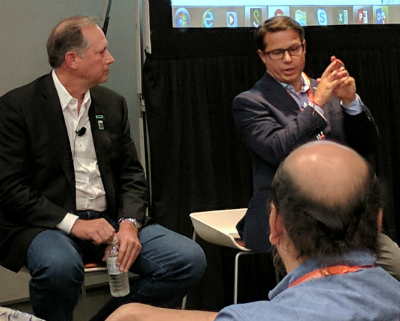 SPICEWORKS SPICEWORLD — At Spiceworks‘ SpiceWorld event in Austin this week, Tim Peters, VP & GM of HPE’s ProLiant Servers and SMB Solutions business; David Sung, director SMB marketing for HPE; and Michael Proper, CEO of ClearCenter, maker of the open source ClearOS, discussed the security and business benefits of HPE’s new Gen10 server line and the devices’ benefits for the small and midsize businesses served by attendees. The standing-room-only session kicked off general programming for the show; HPE will raffle off one ProLiant microserver. HPE’s Tim Peters (left) and ClearCenter’s Michael Proper at Spiceworks SpiceWorld on Oct. 9. HP and HPE along with Cisco are “Pure Capsaicin” sponsors of the event. Other familiar names for channel pros include 8×8, AT&T Business, Datto and Sophos. The value proposition for the Gen10 portfolio centers on security baked into the silicon and firmware and Intelligent System Tuning to optimize performance for various workloads. He also says announcements will be coming Nov.1 around a dedicated HPE SMB ProLiant business unit. In the second quarter, HPE announced a partnership with ClearCenter to pre-load ClearOS, a Linux-based operating system, on HPE servers. Drivers for that, Peters told Channel Partners, include ClearOS’ low cost and features designed specifically to meet the needs of SMBs. For HPE partners, the open-source ClearOS comes at a lower cost compared with Microsoft Windows Server. ClearCenter also offers a marketplace for ClearOS with “hundreds of apps,” said Proper. Because ClearOS comes preloaded on all HPE ProLiant servers at no additional cost, partners eliminate the need to download and deploy the OS software separately. Customers pay for a ClearOS subscription and any additional Marketplace applications only once activated. ClearOS can be up and running in minutes, said Proper. “And there’s zero cost increase for the community version,” he added. “This is targeted at small and midsize and distributed businesses.” ClearOS runs in about 432,000 sites, said Proper. For partners, the open source software model is a win/win. Customers get lower software costs while partners make money from ongoing support, not selling a one-time license and maintenance deal. While you will need some development expertise to provide support services, that’s a smart investment, as we discuss in our free report, 5 Must-Have Development Skills for Modern Channel Pros. On the business side, OSS is a new revenue model as well; our VAR Guy sister site offers a primer on license types. What’s the main Gen10 value prop for small and midsize customers? Cash flow without compromising security, says Peters. 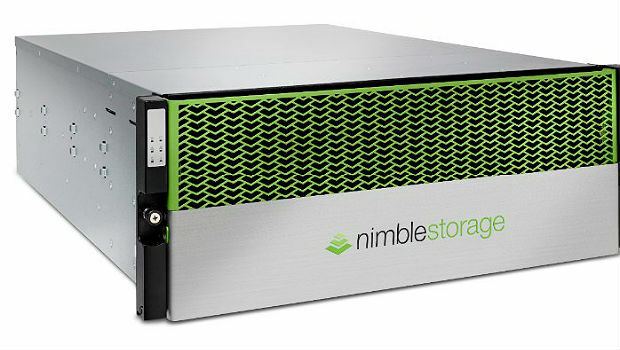 Sung also called out HPE’s Nimble Storage acquisition and said SKUs will be available next month, along with new direct-attached storage arrays starting at $5,500. HPE SimpliVity-branded all-flash arrays will also be priced for the SMB. HPE is coming off an eventful third quarter. It announced last month that it would acquire Boston-based consultancy Cloud Technology Partners to strengthen its hybrid IT capabilities and posted better than expected financial results, including a modest uptick in server sales, followed by reports of impending staff cuts. Attendees at the session quizzed speakers on support for ClearOS and suitability for storing data subject to HIPAA regulations. “We have four types of subscriptions, two with support built in and two with support on demand,” said Proper. 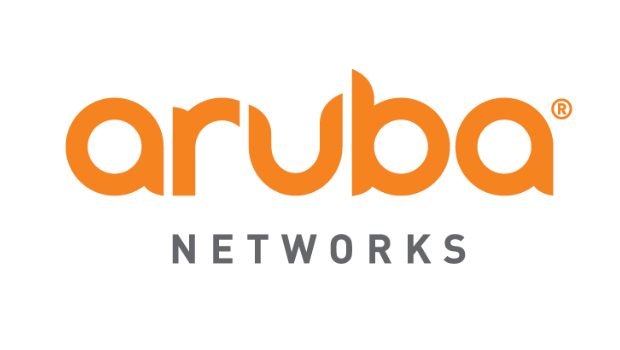 Partner Ready for Networking combines Aruba’s PartnerEdge and HPE’s Partner Ready programs. A new partnership with ClearCenter brings ClearOS, a Linux-based operating system, to HPE Proliant servers. 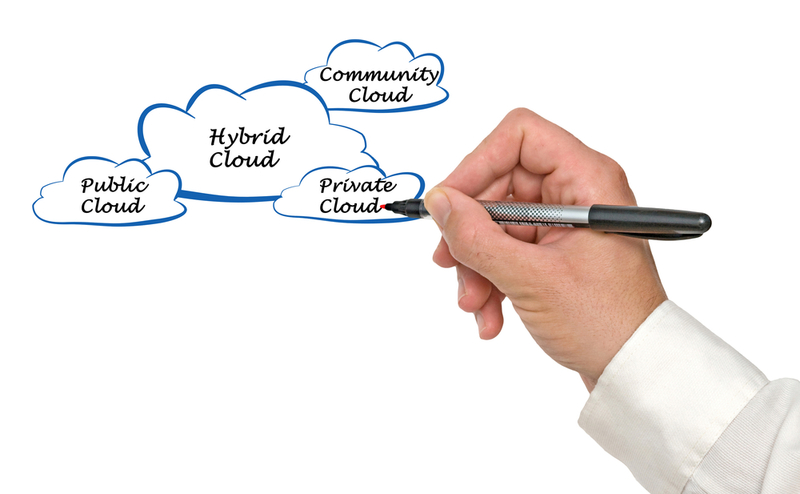 Enterprises get the benefits of a public cloud in a private cloud environment, the companies said. With the acquisition of Nimble, HPE looks to solidify its role in hybrid IT.